June | 2013 | The Way I See It ! I am aware that the life of people sitting in this vehicle is in my hands and they all are my responsibility. Please help me in respecting the trust which my Unit has shown in me and strengthening my will to drive the vehicle safely so that I am able to take them,their weapons and other belongings to their destination safely. 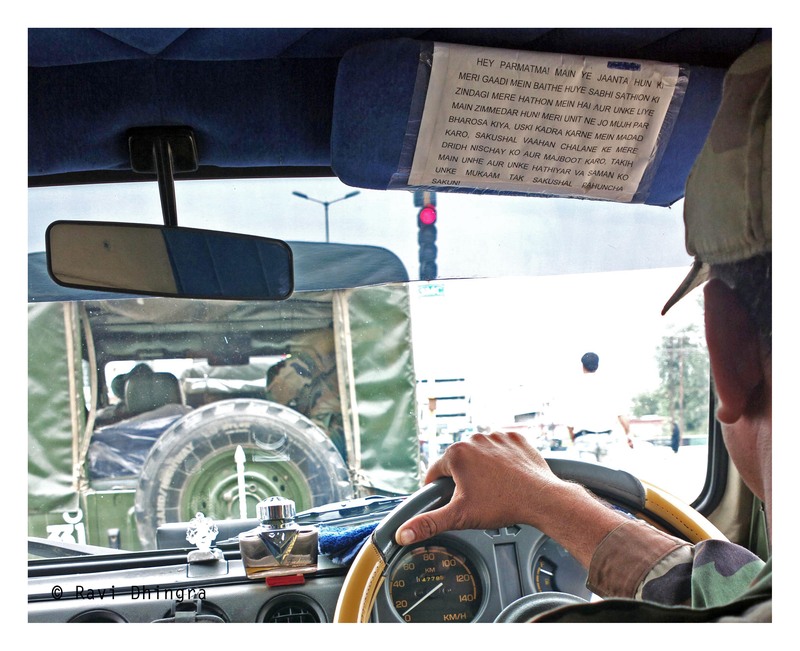 These are a few words written above the steering wheel of a soldier who has been assigned the duty to drive. The statement describes the selfless attitude of the men in uniform who are not bothered about their lives but will not think twice when it comes to saving other’s life. There are two contrasting kind of images which are being seen every hour,every day related to Uttarakhand floods..One kind is of the men in uniform who are trying to evacuate the people stuck in difficult terrains in the hills risking their lives and other kind is of our politicians who are fighting in front of camera to take credit of the rescue operations. in the process of saving lives of people trapped in the mountains in difficult weather conditions,some of these men have sacrificed their lives.They are the true heroes of the country. Day and night they are working in tough & severe conditions without any expectations,least bothered about the media attention they might be getting.After taking all the stuck people to safe locations,they will go back to their respective Units. They are the ones who can be relied upon in case of any calamity,any untoward situation, something like 26/11 terrorist attack in Mumbai.BUT they are the ones who get neglected also-by the people of the country,by the Government,by the media when the going is smooth. When our cricketers win a series abroad,our PM congratulates them. When a privately owned cricket club wins a tournament,the Chief Minister of the State felicitates the players in a public rally just because the name of the club coincides with the State capital. Crores of Rupees are handed over as prize money,land is given away to the players.. Our men in uniform are not the lucky ones..they will be forgotten after some time like in the past,their sacrifices will also be forgotten. The families of the Martyrs will be promised many things but it will be a struggle again to get what has been promised..